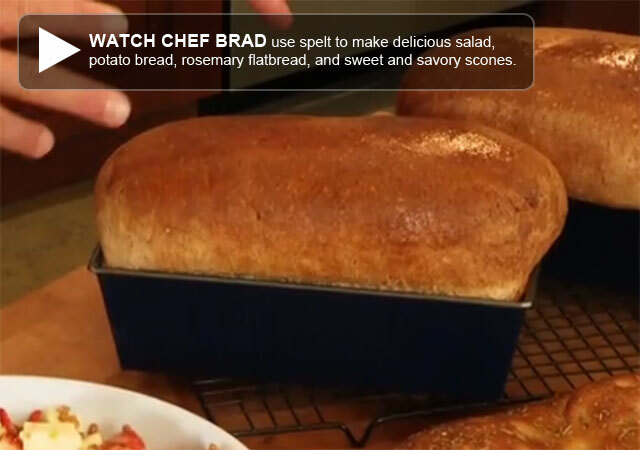 To educate you about grains, we have enlisted the resources of Chef Brad. Click here to see more episodes. This grain has been around since early 5000 B.C. in what is now Iran. It continued to grow and be harvested in other countries, such as Germany, Italy, Switzerland, and other parts of Europe. Purity Foods reintroduced it into North America in 1987. Today, Spelt is becoming more popular with bakers, manufacturers, and consumers. Spelt is unique in more ways than one. Spelt has an incredibly strong hull, which protects the grain from pollutants and insects. This is an excellent characteristic especially when wanting to store this grain. Also, Spelt contains more 30% more protein, more fat, has a higher mineral content and more amino acids than wheat. It has considerable B vitamins, magnesium, and fiber. Added to that wonderful list, spelt is water soluble, which makes it easier for your body to absorb the nutrients. But what if you can't have wheat, but would like to eat Spelt? 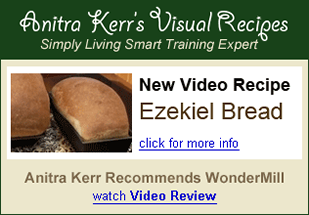 Well, Spelt is actually considered an excellent alternative to wheat. 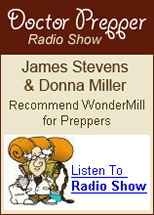 Because this grain is unhybridized and contains low gluten it may be just what you need. But we suggest consulting your doctor about using Spelt as an alternative for wheat sensitive individuals. As you can see, Spelt is a fabulous grain, packed full of nutrients and complex carbohydrates. Spelt can be used in almost every recipe where wheat exists: cereals, pastas, and crackers, pancake mixes, cookies, and so on. With a little experimentation Spelt can become a large part of your diet. You won't want to miss this wonderful opportunity to do something wonderful for your body. Go ahead and give Spelt a try. Spelt contains more protein, fat and has more minerals than wheat. Spelt has large amounts of B-17 and special carbohydrates that aid in blood clotting and stimulating the immune system. Spelt contains a strong hull, perfect for storing. Spelt has a delicious nutty flavor. 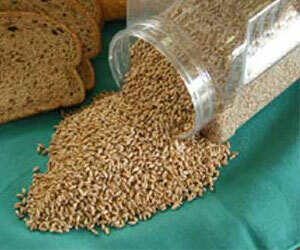 Spelt can be used in cookies, cereals, pastas, bread, crackers and much more. Quinoa, White: There is more to Quinoa than just the funny name. Quinoa has been named the -Supergrain- by nutritionists because of its amazing and super qualities. Dating back to 3000 B.C. this seed has been a vital part of the Andean diet. It was used in baking as well as many other dishes eaten by the Andeans. Over the countless years, since its beginning, Quinoa has gone from wonderful, powerful, and desirable to poor and unwanted food. Because of the rise of the Spanish, other grains were introduced and grown overtaking Quinoa. Therefore, the numbers amazingly plummeted from 111,000 acres to 32,000 acres in 30 years. 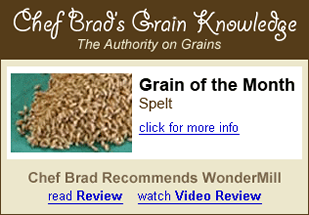 Spelt: This grain has been around since early 5000 B.C. in what is now Iran. It continued to grow and be harvested in other countries, such as Germany, Italy, Switzerland, and other parts of Europe. Purity Foods reintroduced it into North America in 1987. Today, Spelt is becoming more popular with bakers, manufacturers, and consumers. Spelt is unique in more ways than one. Spelt has an incredibly strong hull, which protects the grain from pollutants and insects. This is an excellent characteristic especially when wanting to store this grain. Also, Spelt contains more 30% more protein, more fat, has a higher mineral content and more amino acids than wheat. It has considerable B vitamins, magnesium, and fiber. Added to that wonderful list, spelt is water soluble, which makes it easier for your body to absorb the nutrients. Chia Seeds: Chia is familiar to most of us as a seed used for the novelty of the Chia Pet tm, clay animals with sprouted Chia seeds covering their bodies. Little is known, however, of the seeds tremendous nutritional value and medicinal properties. For centuries this tiny little seed was used as a staple food by the Indians of the south west and Mexico. Known as the running food, its use as a high energy endurance food has been recorded as far back as the ancient Aztecs. It was said the Aztec warriors subsisted on the Chia seed during the conquests. The Indians of the Southwest would eat as little as a teaspoon full when going on a 24 hour forced march. Indians running from the Colorado River to the California coast to trade turquoise for seashells would only bring the Chia seed for their nourishment. Millet: One of the super grains, gluten-free millet is probably one of the most versatile and nutritious of all grains. It is very rich in amino acids phosphorus and vitamin B as well as lysine, a high-quality protein vitamin. Its iron content is highter than any grain except for amaranth and quinoa. Amaranth: Amaranth can be ground into flour and the flour can be used for almost anything. From thickening sauces to cooking for breakfast, you will love the lightness of the flour. It's nutty, but the mild flavor is not offensive or overpowering. It is a gluten free grain. Although I love the flour, this grain really comes to live popped. To pop this grain, use a deep pot with no oil. Just heat the pot and place a pinch to see if the pot is hot enough. If those pop than you are ready to go. Add no more than 2 tablespoons at once, adding more will cause this delicately small grain to burn, 1/4 cup will yield 1 cup of popped Amaranth. Kamut: The most striking superiority of Kamut is found in its protein level, up to 40% higher than the national average for wheat. Compared to wheat, Kamut is higher in 8 out of nine minerals, such as magnesium and zinc. It contains more of the natural antioxidant selenium, has 30% more Vitamin E, up to 65% more amino acids, and boasts more lipids and fatty acids. Because of its higher percentage of lipids, which produce more energy than carbohydrates, Kamut can be described as a "high energy grain". Athletes, people with busy lives and anyone looking for quality nutrition will find Kamut a valuable addition to their diet. These grain suppliers have the best products and quality control that we have found anywhere in the USA.